It is not uncommon for popular entertainment to combine two different genres. The theory is that if you can captivate fans of both genres, you double the potential audience. 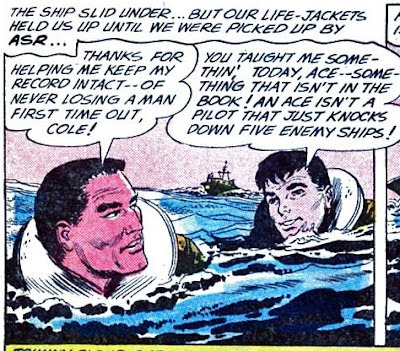 As I noted recently, most comics, regardless of their main focus, frequently had romantic subplots. 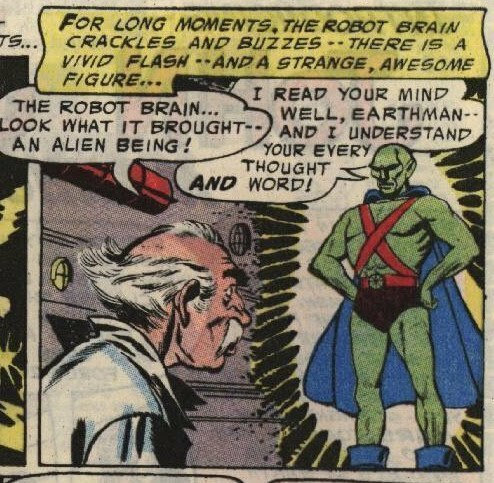 Much of the DC universe in the early 1960s consisted of a combination of superhero and science fiction; think of Batman facing all those aliens and monsters, for example. 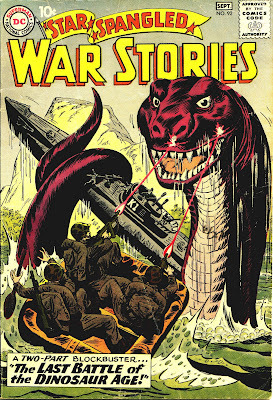 Kid are fascinated by war, kids are fascinated by dinosaurs, so let's give them war stories with dinosaurs. Is there anything else kids are fascinated by? Oh, yeah, Indians (aka Native Americans). 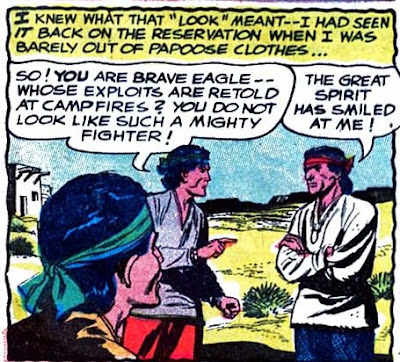 So let's give them a series about a Navaho pilot in World War II. Johnny Cloud was the result, and it's a pretty interesting series. The stories had a very basic template. 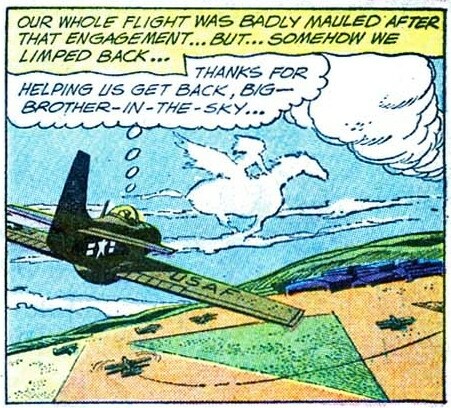 A problem in the present (WWII era) reminds Johnny of an event in his past as a young brave. Johnny uses that prior experience to solve the proble. Sound familiar? Well, if you watched the first few seasons of Lost, you saw that template used over and over again. 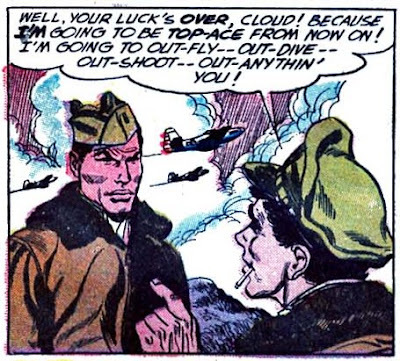 Johnny Cloud lasted until the end of All-American Men of War with issue #117 (Sept-Oct 1966), then made a couple of guest appearances in other DC war mags. He was a charter member of the Losers, a group made up of discontinued features. The whole thing results in Superman being sucked into the past and Superboy being sucked into the future. 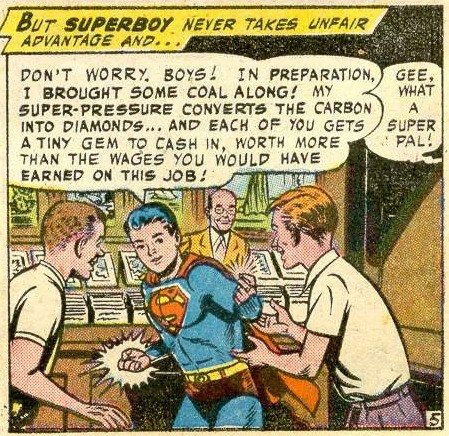 As I've been reading much of the early Superboy stories in Adventure and now Superboy, I've been surprised to see that many of the things we thought were newly introduced in the Silver Age actually were reworkings of Golden Age storylines and characters. 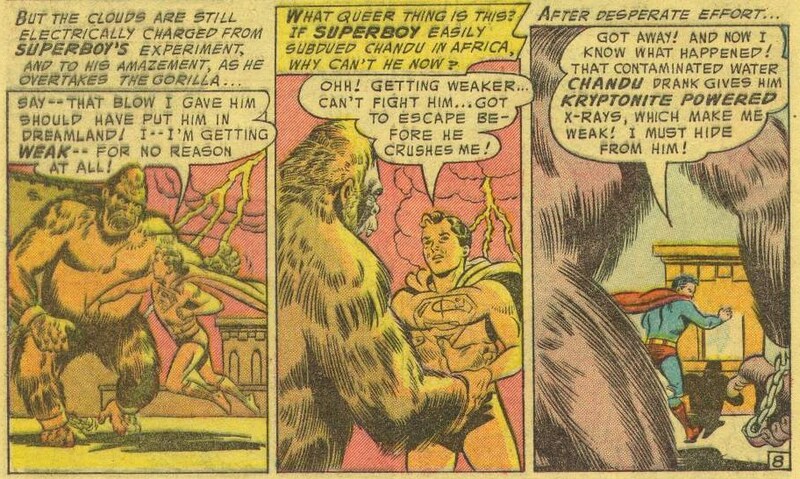 What about the Thought Beast from Krypton? I haven't yet been able to locate a third example, although I'm certainly looking for the metal-eating beast. The reporters are on a jungle expedition that involves a valuable diamond used as an idol's eye. Superman creates a diamond by compressing coal. 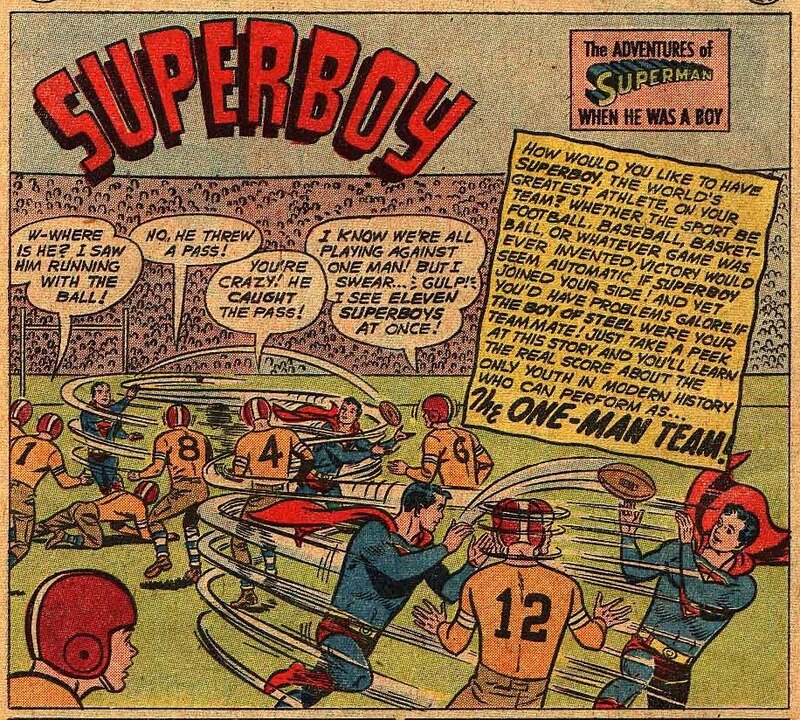 The episode appears to have originally aired sometime in 1953. But the diamond turns out to be a problem, as the jeweler in Smallville doesn't believe it could be real and the one in Metropolis assumes they stole it. I gave it a shot anyway. I pointed out that HPHT required an elaborate press of intricate geometry to concentrate the compressive forces. 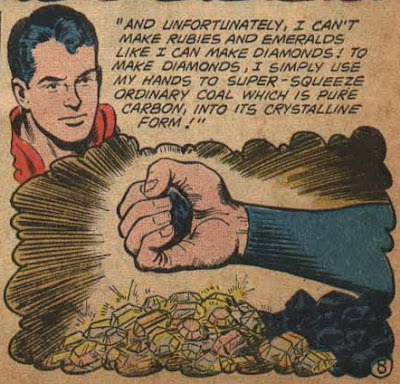 It wasn't as if Superman could just grab a lump of graphite and squeeze it like a tomato. He's Superman, said Una. 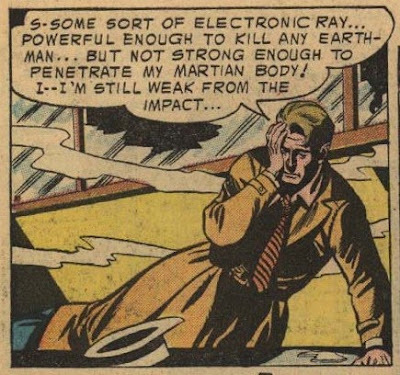 According to Wikipedia, he can withstand the impact of a nuclear explosion. 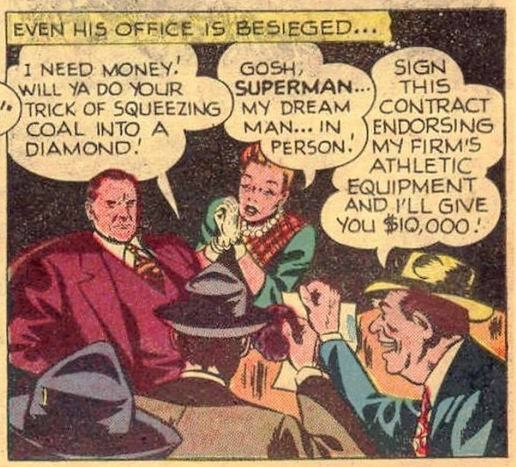 You're saying diamonds are going to stymie him because he hasn't got the right belt-press jig? Me: I'm saying if "he's Superman" is the answer to all questions, why are we having this discussion? He can do anything he wants by magic. We're trying to establish what somebody with unlimited strength could do in real life. Una: Nobody has unlimited strength in real life. Me: I know that. That's the point. We have to set some reasonable bounds on the question. Let's say you've got enough strength to manage 130,000 atmospheres. Is that alone enough to create a diamond? I say no. Never mind the special press, you still need a temperature of 3,100 degrees. 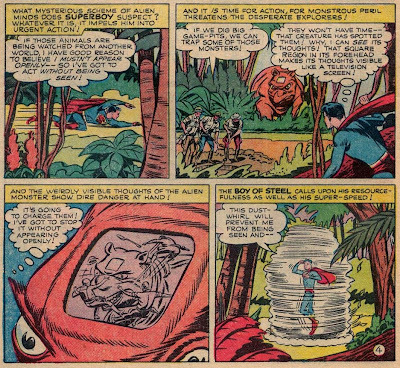 Skimming over the trees, Superman sees a coalmine, and lands there with Gus. Walking over to a pile of coal, he grabs one piece and uses his super strength to make a large diamond in his bare hand. 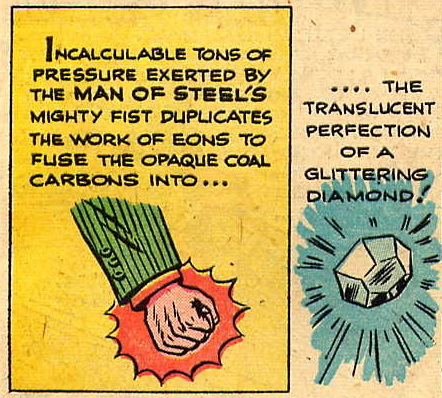 I can't remember coming across another example of the diamond-making bit in an Adventure issue prior to #231. 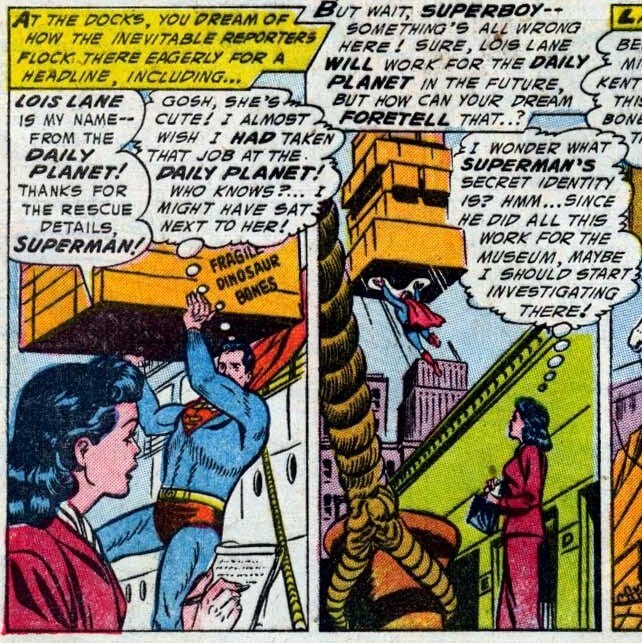 My guess is that it happened in that Superman episode I recall, and the writers/Weisinger picked it up from there. 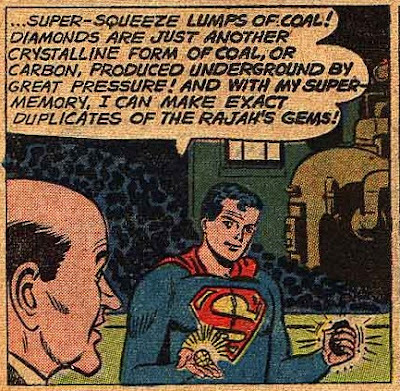 I will look for examples of Superman creating diamonds in the comics as well and will update this post as needed. Any help from my readers and other bloggers is, of course appreciated. As I have noted in the past, one of DC's major trends of the late 1950s and early 1960s was to add continuing characters to the magazines that did not already feature them. 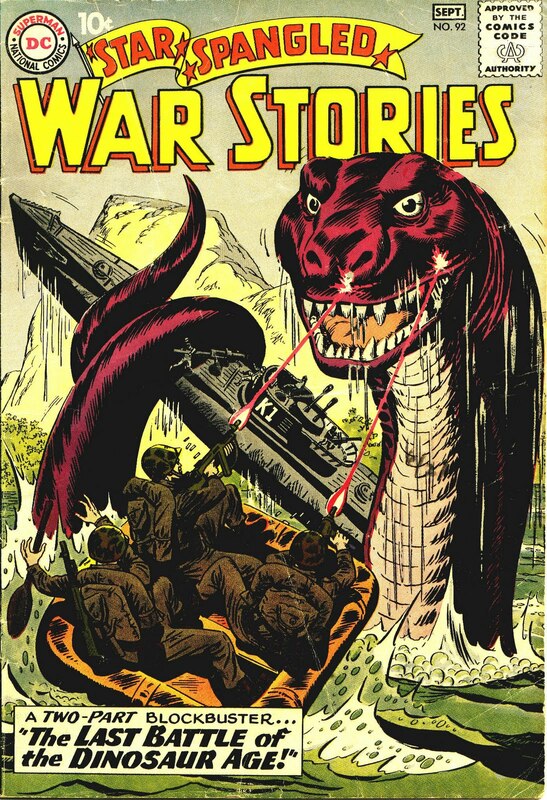 The war books picked up Sgt Rock, Jeb Stuart, Gunner and Sarge, etc., while Mystery in Space added Adam Strange, Tales of the Unexpected featured Space Ranger, and House of Secrets highlighted Mark Merlin. 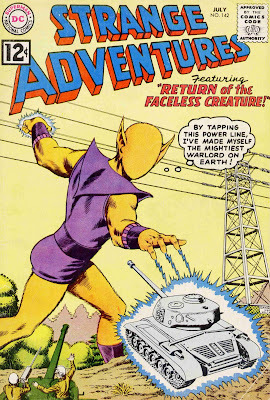 Strange Adventures, edited by Julius Schwartz, tried something different. 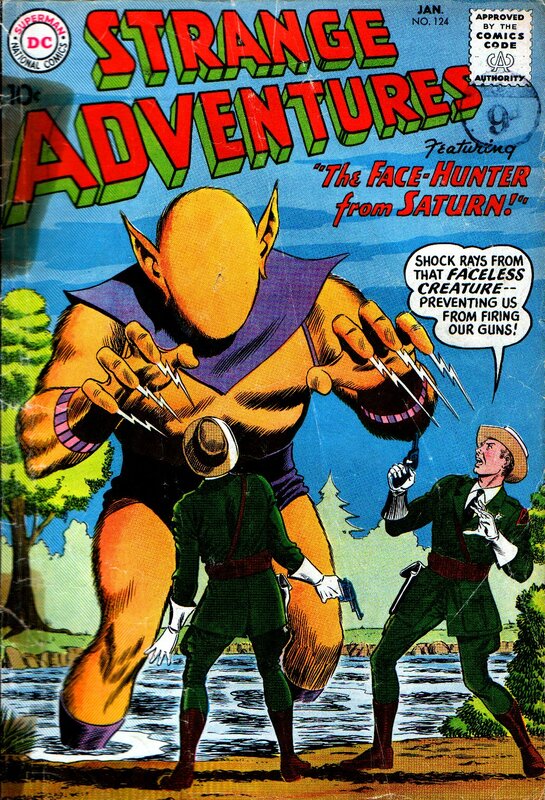 Instead of adding one feature which appeared every issue, Schwartz rotated several recurring features: Star Hawkins, the Atomic Knights and the Space Museum appeared regularly over the course of several years. 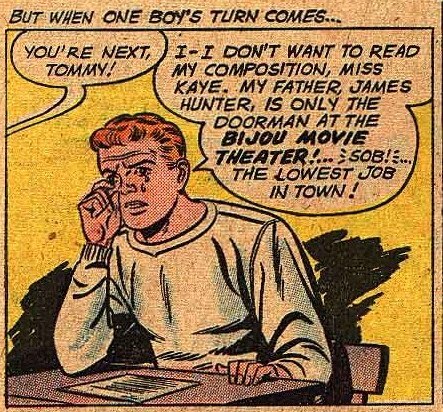 In addition, particularly successful one-shot characters were often brought back. 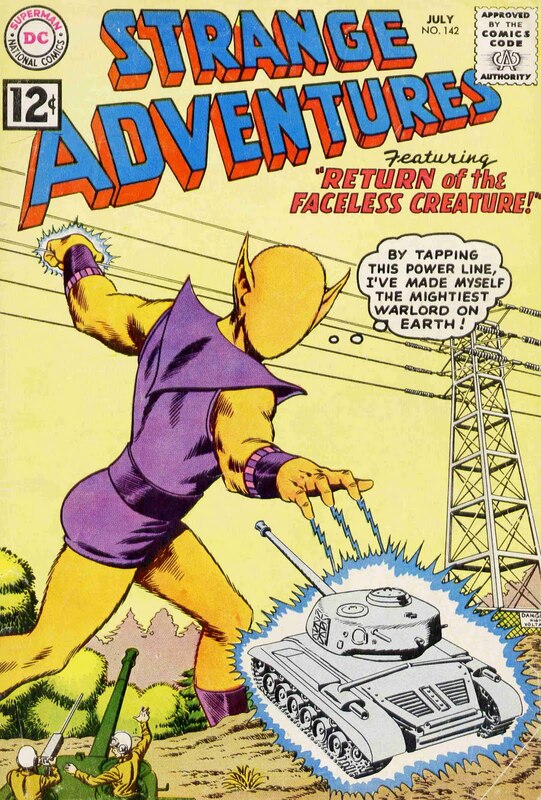 The Faceless Creature was probably the most notable as he appeared on the covers of three* issues over the course of as many years. Those of you who are fans of the Brave and the Bold show on Cartoon Network may recognize him as the Hunter who served as Starro's herald in a two-part episode of that series. 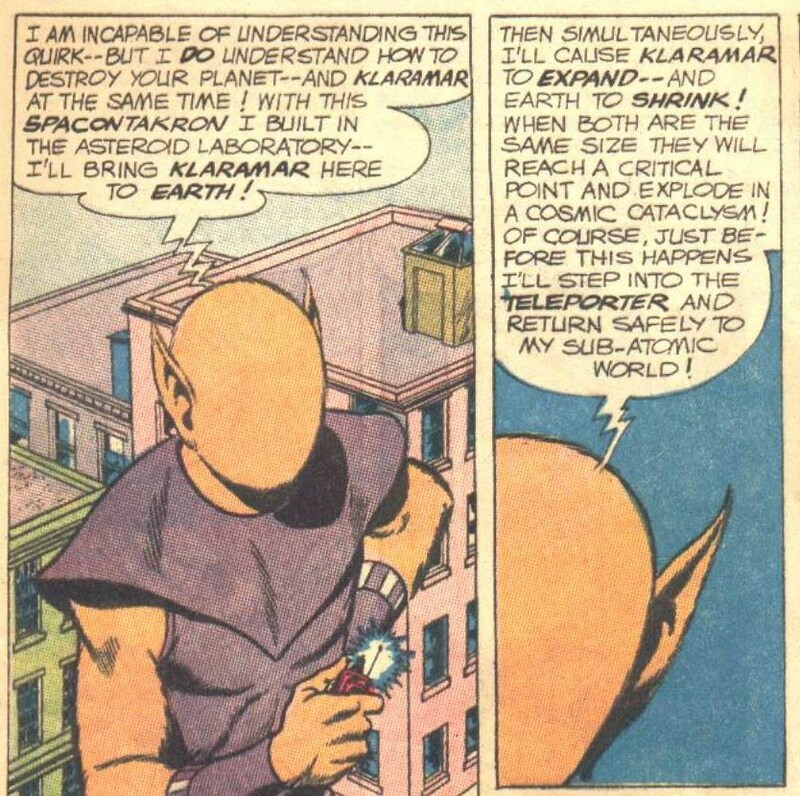 After preventing them from firing their weapons as shown on the cover, the alien introduces himself as Klee-Pan from the planet Klaramar, which is a sub-atomic world revolving within a single atom of the Planet Jupiter. He explains that he is looking for a giant head which will unlock a vault where a bomb was hidden by a villain named Chen Yull (sometimes referred to as Chan Yull and also as Chun Yull). If the head is not located, the bomb will destroy the entire solar system in one second. The mathematician in me couldn't resist calculating that out. 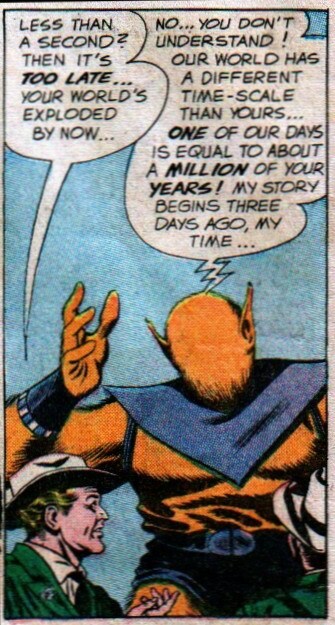 If one Klaramar day equals 1,000,000 Earth years, then one Klaramar second equals about 11-1/2 Earth years. 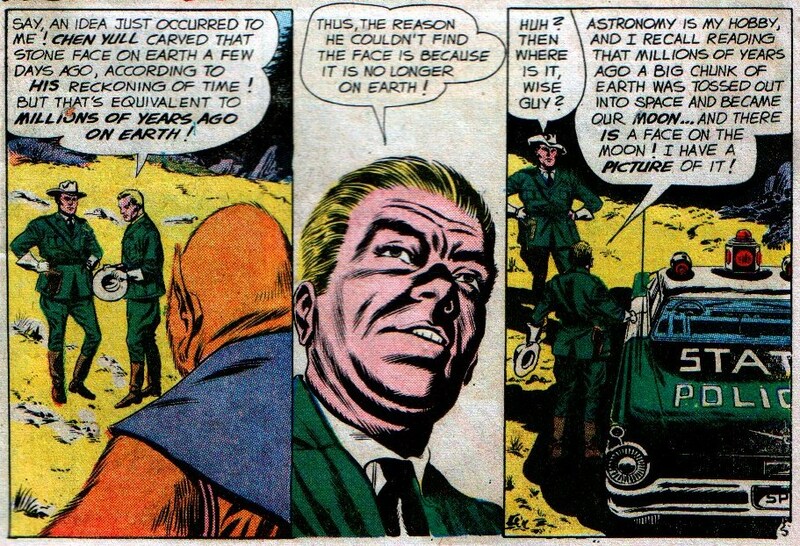 So he suggests the Woman in the Moon. Of course, most of us have heard of it as the Man in the Moon, but apparently the Chinese and South Dakotans have the gender reversed. And by repairing the face, they are able to open the lock, defuse the bomb, and save the solar system. Klee-Pan offers them a reward, but all they want is for the face on the Moon to be restored. 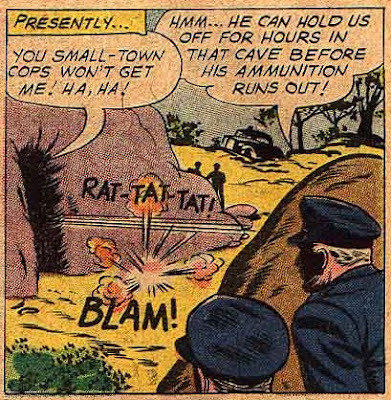 But when they arrive the bomb does not explode. 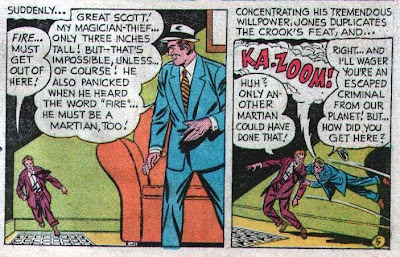 It turns out that Jim and Bob were given the power of telepathy by Klee-Pan, and so they had ordered each other not to explode the bomb. Klee-Pan sends them back to Earth with weapons that subdue Chen Yull and send him back to Klaramar. 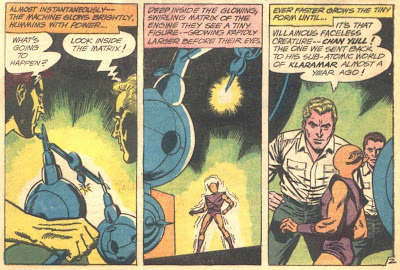 Jim and Bob use the weapons they defeated Chen Yull with in the previous story on each other, shrinking themselves down while sending themselves to Klaramar. Once they are able to communicate with Klee Pan, he defeats Chen Yull and restores the two planets (and the Highway Patrolmen) to their normal sizes. 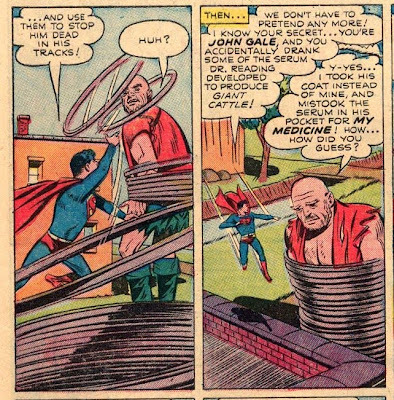 One other oddity about the series; according to the GCD, the pencils on the three stories were done by three different artists: Mike Sekowsky, Carmine Infantino and Gil Kane. 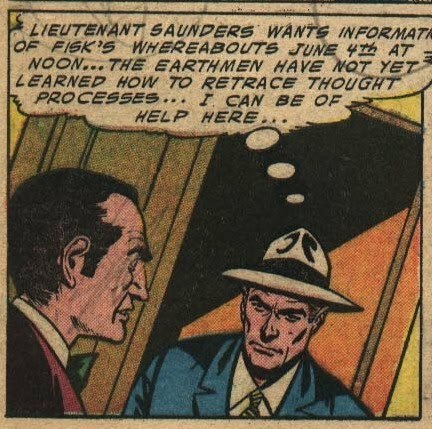 I was able to identify the latter two, but the first one really doesn't look much like Sekowsky at all to me except for a few panels. 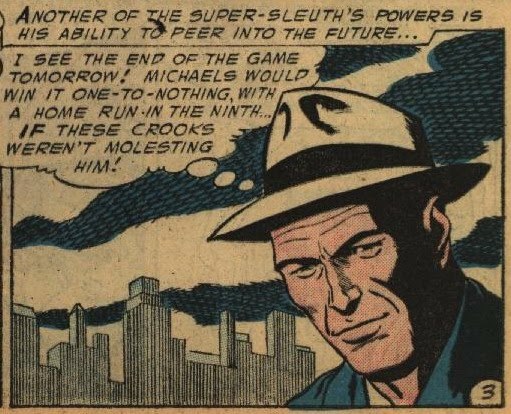 Then again, I noticed how heavy the inks were on that story (by Murphy Anderson), so maybe it's just a case of the pencils being overwhelmed. *Technically two different faceless creatures appeared on the three covers; Klee-Pan on the first issue and Chan Yull on the other two. 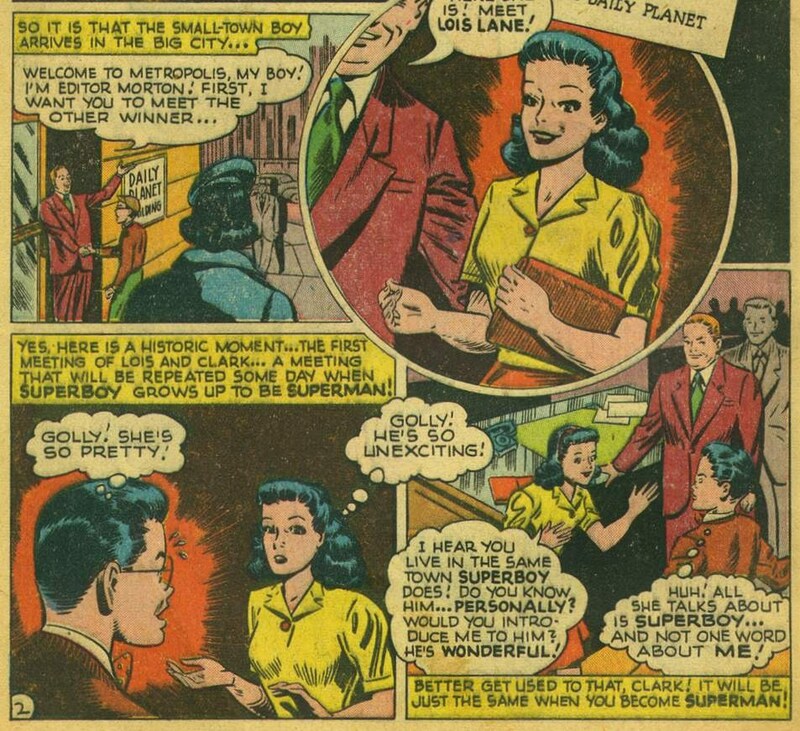 Jacque Nodell's boyfriend checks in with a post on collecting romance comics as a teen. 1997 was a great year. I was 18 years old then, and now look back on it quite romantically. I was a traveler exploring new lands and acquiring new treasures. From Detroit to Chicago to Indianapolis, I took back with me to Lafayette, Indiana hundreds of romance books. All of which were gifted to Jacque around 2008. And though she has acquired many more hundreds over the past few years, you might say that these books were the foundation on which Sequential Crush was built. I confess that in my collecting years, I don't think I ever bought a romance book. But it is one of the oddities of romance that it's the one storyline twist that appears in every other genre. 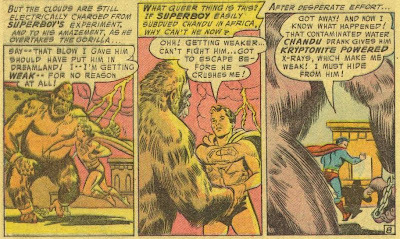 It's no surprise to find a romantic interlude in a superhero comic, or a sci-fi mag or even Sgt. Rock. 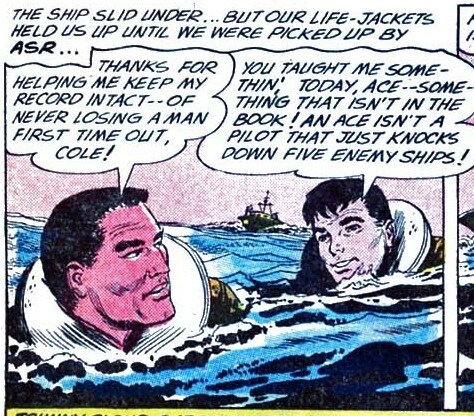 So even though I didn't buy romance comics per se, I did buy plenty of comics with romantic elements. 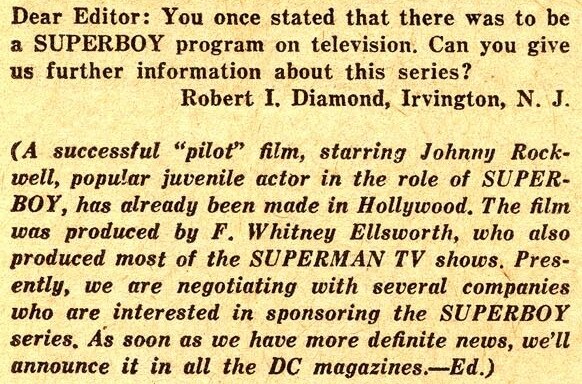 Superman Fan has reached the end. 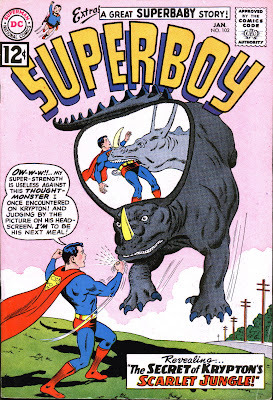 Over the years, I’ve had a great time digging through old comics to come up with things to say about Superman and his world, and even more fun interacting with visitors who’ve shared their own opinions, expertise and ideas. 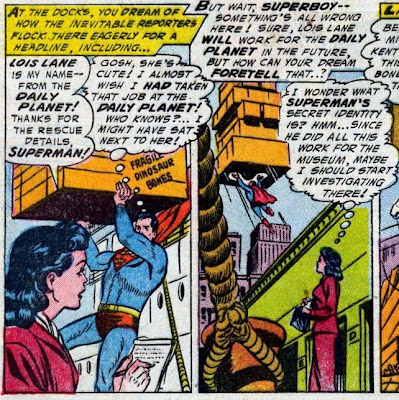 The hard truth, however, is that I’ve just about exhausted my collection of comics to review and clippings to share, though obviously I’ve only just scratched the surface of Superman’s long career. I've often regretted that I made the subject matter for this blog so incredibly vast, but one thing's for certain; I'm not going to run out of material anytime soon! Commander Benson takes a long look at the second set of teamups between Green Lantern and the Flash. What I am struck with in reading those stories is how much Hal and Barry (and Iris and Carol) became friends over the course of those adventures. Over at Chasing Amazing, Mark covers a horrifying new trend: turning old comics into trading cards. Yes, that’s somebody taking an issue of Amazing Spider-Man #2 (please note, one of the missing issues in my quest) and cutting out a panel of the Vulture (his first appearance in a comic) to be featured on an Upper Deck trading card. In mint condition, that comic could net someone thousands of dollars. The comic featured in the video, by my humblest guestimate, is probably in Fair, maybe, MAYBE Poor condition (though I feel the cover is too complete to be considered a Poor), which would only net the reseller a few hundred dollars. According to Beckett.com, these comic book cards, dubbed Upper Deck Marvels, are already bringing bids as high as $80. I'm not a terribly religious person, but that strikes me as downright sinful. Brian at Comics Should Be Good covers the five goofiest moments in the first five Human Torch stories in Strange Tales. I enjoy the heck out of these five goofiest moments, because a) they're really goofy and b) Brian does them with a real love for subject matter while accepting that they were intended as throwaway entertainment for kids. Plus he absolutely nails the single silliest bit, which was the effort to make the Torch have a secret identity in those stories, even as the Fantastic Four issues made it obvious that he didn't. As you can see, after an origin sequence, the story starts out with a young man who's embarrassed because his dad's occupation is a lowly doorman at the local movie theater. I particularly love the speech his dad (the terrific and forgotten actor, Ross Elliott) gives starting around 5:10 about how if he gets his son through college and into his chosen profession, he'll consider himself as successful as anyone his son knows. 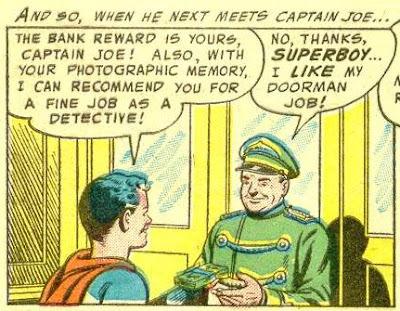 As you can see, the focus in the comic is on Captain Joe's phenomenal memory, while in the TV pilot, he's working on becoming an artist. But in both cases he identifies the crooks. 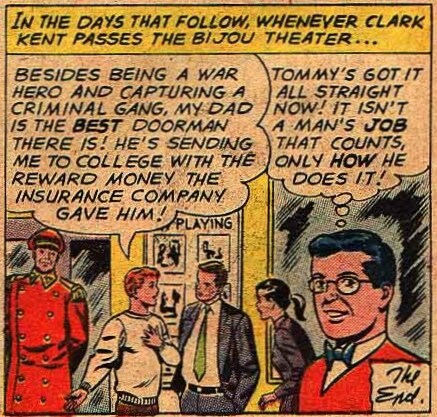 The robberies are slightly different, with the criminals stealing diamonds from the movie theater in the TV version, while in the comic they stick up a bank nearby. The other thing that is interesting in the pilot is the relationship between Clark and Lana. 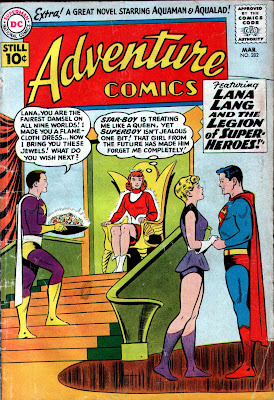 In the comics it was occasionally hinted that they were more than just friends, but more commonly Lana was just an annoying secret identity pest. In the TV show, it certainly appears that they are dating; note the way they're holding hands after class when they catch up to Jimmy at around 2:48 into the first part. 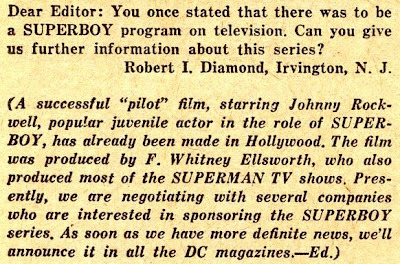 Update: Commenter Tmdess remembered the story being published yet again, and it didn't take me long to find it (with an assist from Commander Benson), in Superboy #88 (March 1961). As you can see, this story is even closer to the Superboy pilot, with the diamonds being stolen from the movie theater while Superboy is dealing with a crook shooting madly from a hideout. 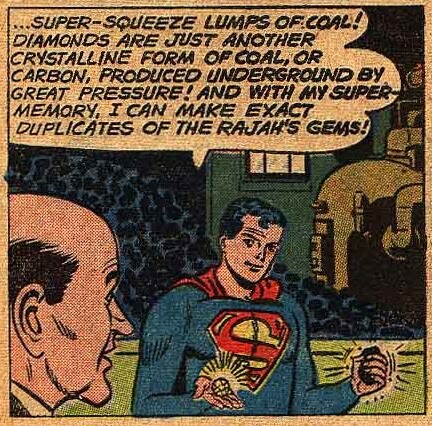 It even has the bit where Superboy makes replacement diamonds out of coal. This may not be a complete look at the swipes, but I am confident I have identified most of them. 1. The swipes all fit into the course of 27 issues; in that run, there were 9 swipes. 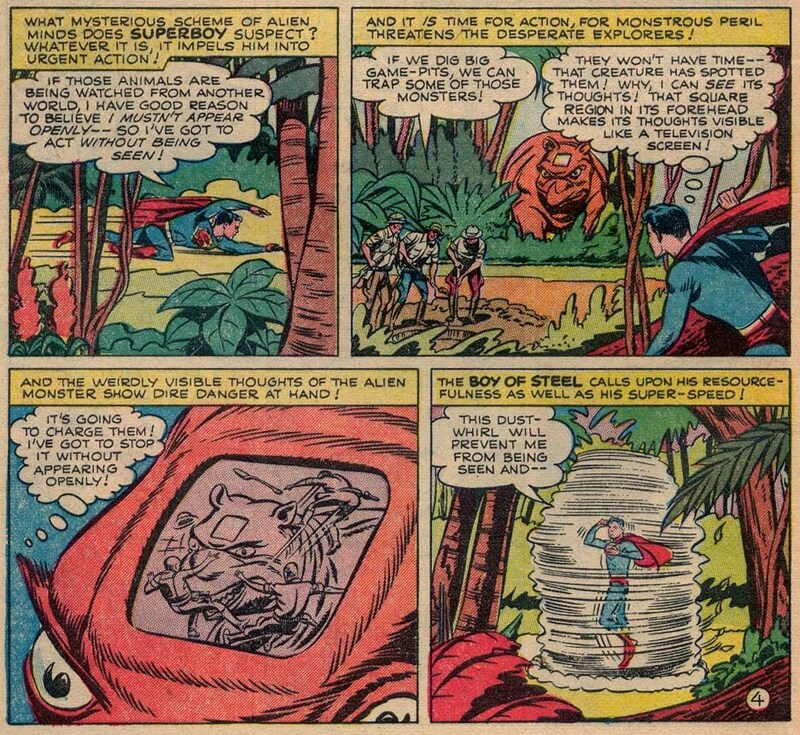 Thus, about 33% of the Superboy stories from Adventure #276-302 were swiped from earlier tales. 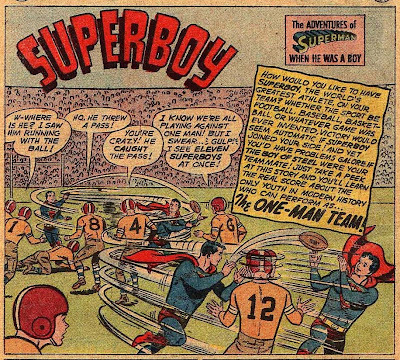 These issues were published from September 1960 to November 1962. 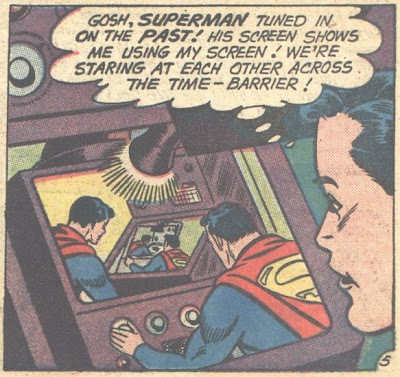 Note that this applies to the story in Superman #145 as well, which bore a cover date of May, 1961. 2. 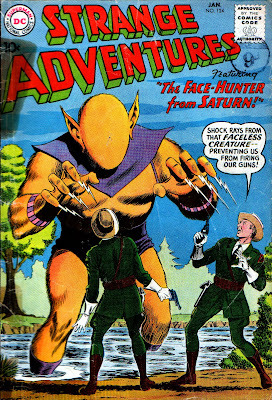 The stories they were swiped from came from the course of 24 issues of Adventure; #176-199, or May 1952-April 1954. 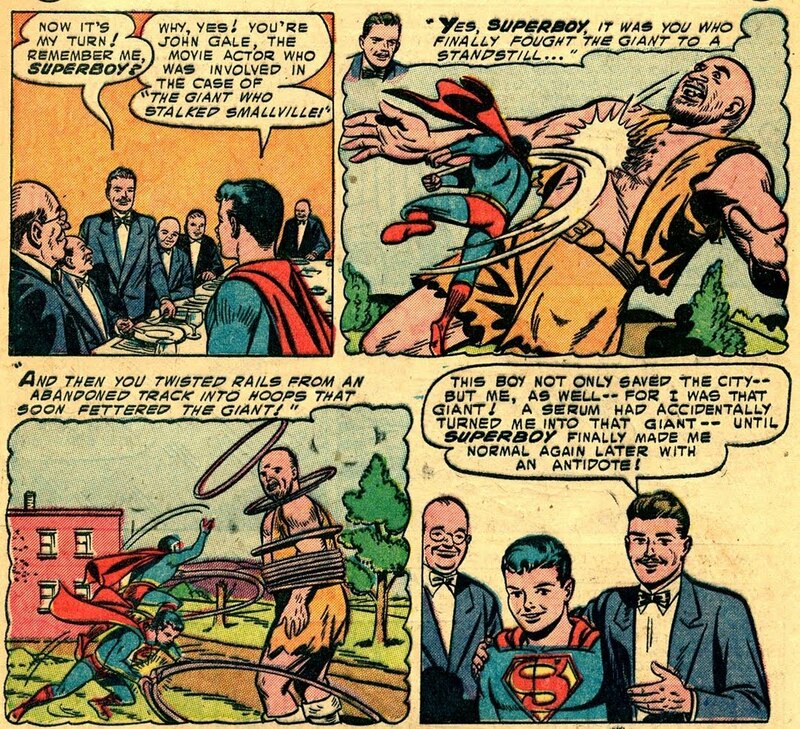 The story in Superboy #49, which was swiped in Adventure #276 falls out of this range, appearing in June 1956. 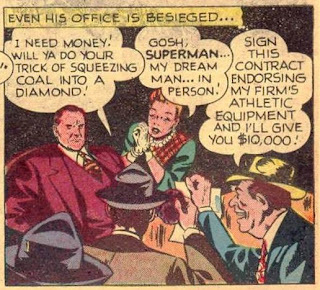 The comics companies were all under pressure to raise their prices in the late 1950s and early 1960s. Dell Comics tried to lead the way to a 15-cent cover price in 1958, but eventually had to go back to 10 cents when the competitors didn't budge. 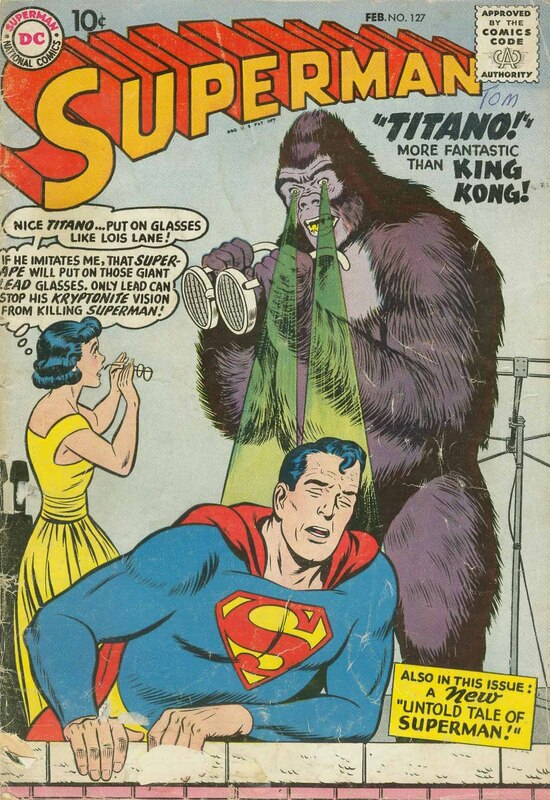 But in December 1961, DC raised the cover price of all its magazines to 12 cents and their competitors followed suit. 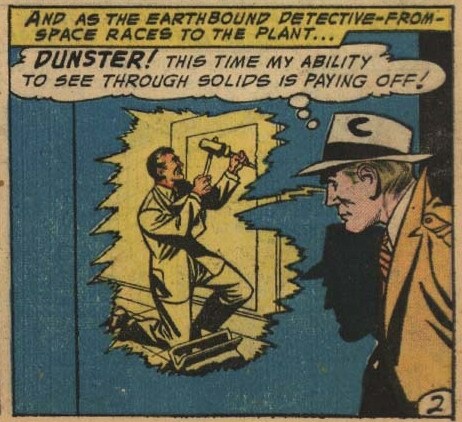 I strongly suspect that Weisinger was trying to cut costs wherever he could to maintain profitability. It would make sense that he could pay his writers somewhat less for recycled stories; as I have documented, many of the stories were almost word for word swipes from the earlier tales. 1. The price increase reduced the pressure to cut costs. Two cents may not sound like a lot of money, and in all probability DC split the increase with their retailers so that they only netted a penny. 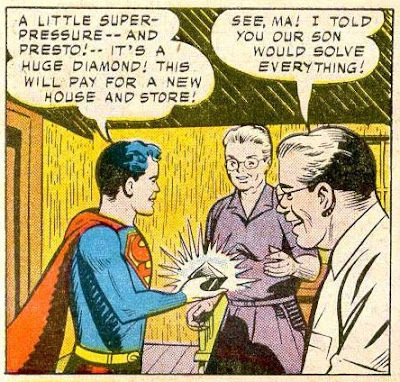 But in 1962, Adventure Comics was selling 415,000 copies an issue; that works out to an additional $4,150 in revenue to DC. 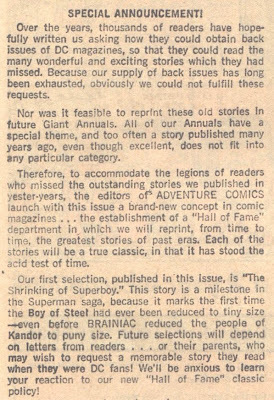 It's true that circulation did drop with the price increase, from 460,000 in 1961, but if we assume again that DC was only getting half the old 10-cent cover price from their retailers, the net increase is still $1,900. 2. 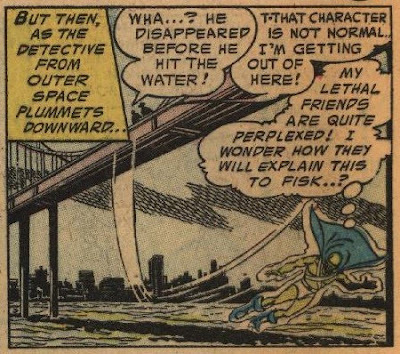 The increasing influence of fandom may have caused Weisinger to cut back on the swipes. 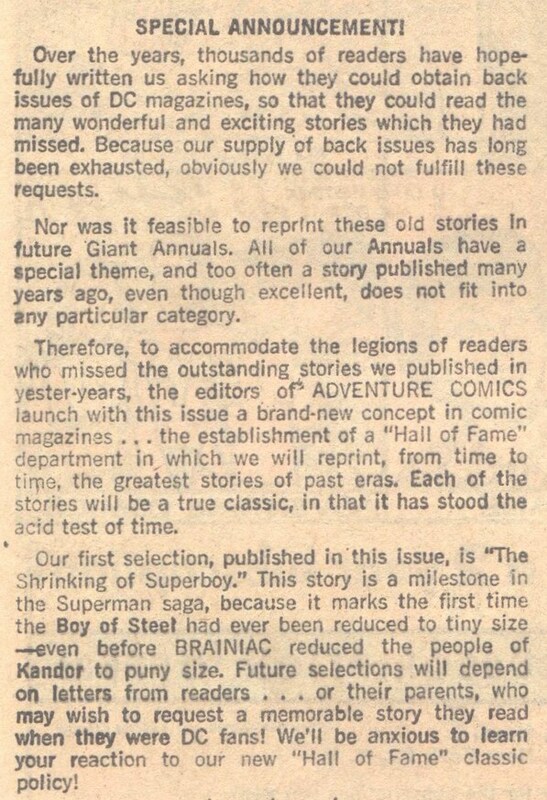 Although I was unable to locate a letter in the Adventure letter columns complaining about the recycled stories, I doubt that it went completely unnoticed by the older fans. 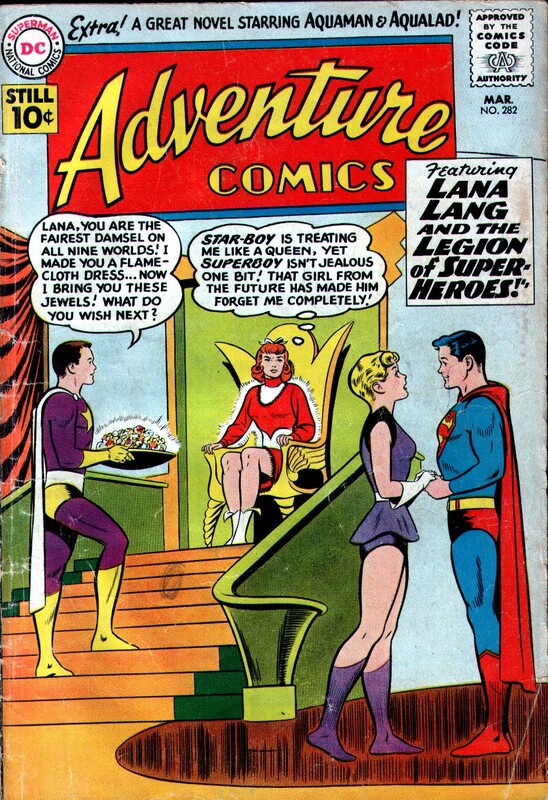 The Hall of Fame classics were published until Adventure #345, after which the Legion stories were expanded to book-length. Incidentally, I first became aware of the Superboy swipes sometime in the 1960s or early 1970s when DC reprinted the story in Adventure #191 and its swipe in Adventure #290. I can see that the latter tale was reprinted in Superboy #147, but the GCD does not show when the former tale was republished. 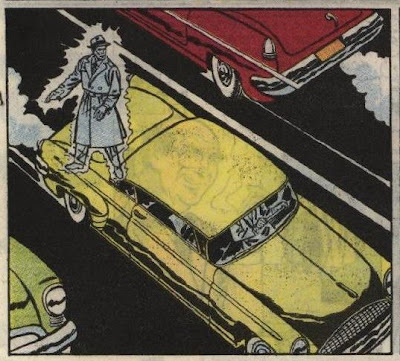 Anybody know what issue that was? 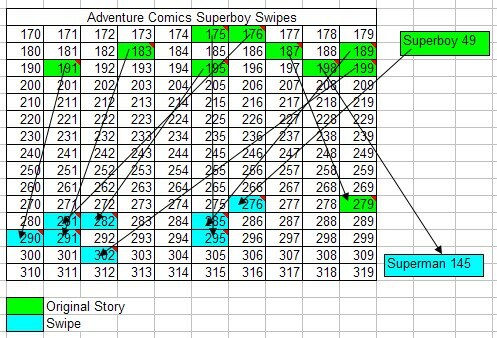 Update: Discovered that Adventure #279 was a swipe from #187; I have updated the graphic and a few other places in the original post. 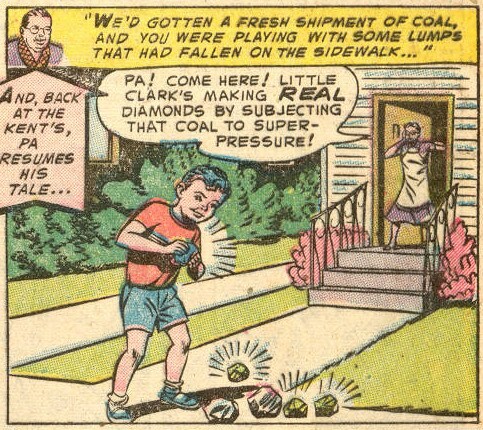 A bunch of Smallville residents come up with a way to mimic one of Superboy's powers. 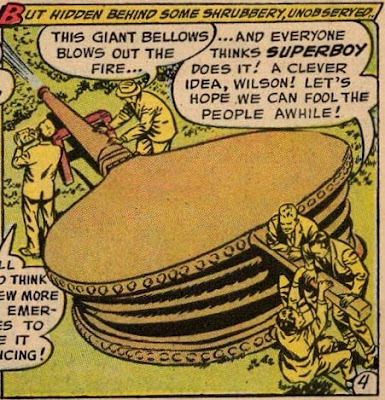 We'll assume that the giant bellows came from a Gotham City advertising sign. DC could be maddening about this; for example, I can show you at least a half dozen stories about how Clark Kent/Superman met Perry White, each of which contradicts the other five. But at the same time, there were stories that legitimately referred to prior issues. I talked about some other continuity examples in the Golden Age of Batman last year. It was noted in a recent post at Comics Should Be Good that the Martian Manhunter's powers were quite extraordinary and that they kept growing as needed by the plots. 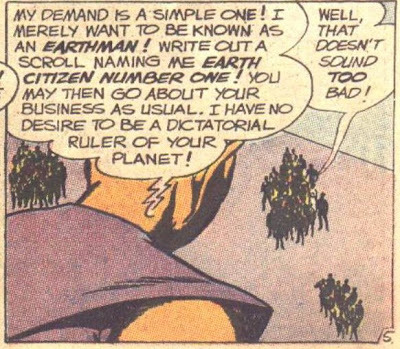 So here's a look at what J'onn J'onnz could do. 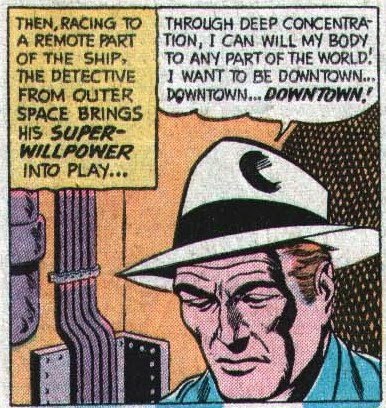 He can make his body insubstantial, and turn invisible. Of course, you can argue that the invisibility power is simply a use of his ability to change his appearance. Making his body insubstantial is a power that has many applications in the stories. For example, he often uses it to walk through walls or to let bullets pass through him. Note that he is not just seeing into the future, as the text states. He's seeing into a future that no longer exists. 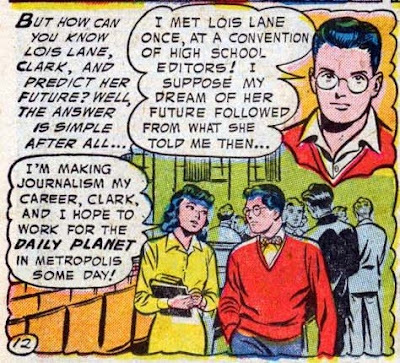 Indeed, in the story, Jones has to intervene to make that future come true. 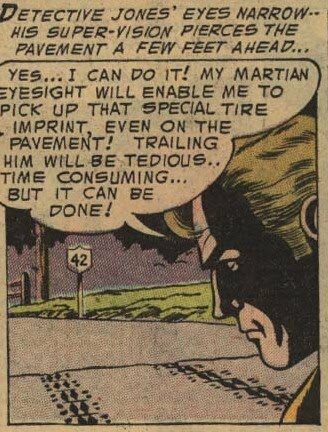 Martian molecular hypnosis? 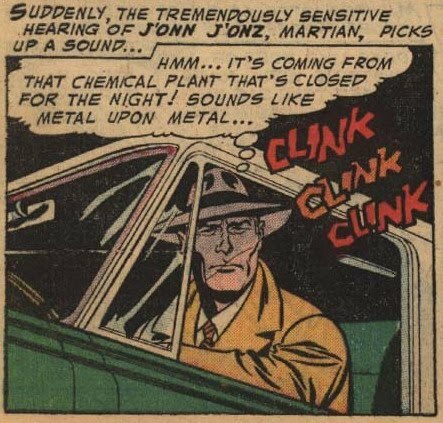 That's really just mind over matter, as Jones admits in a later panel. Retracing thought processes is just an application of mind-reading. Is he flying? Or just using an application of his mind over matter ability? I'll go with flying here, but obviously that's a judgment call. 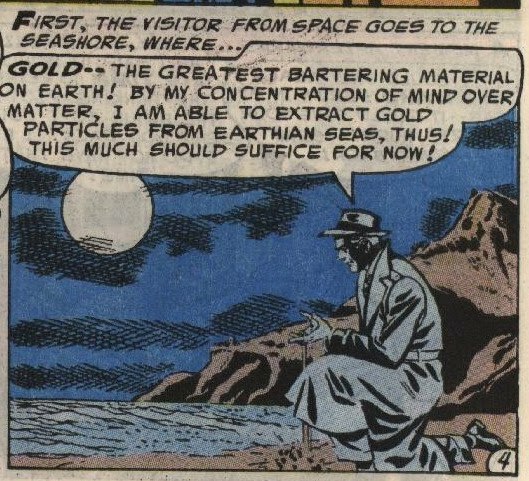 But if he can teleport himself anywhere in the world, couldn't he also teleport himself back to Mars? 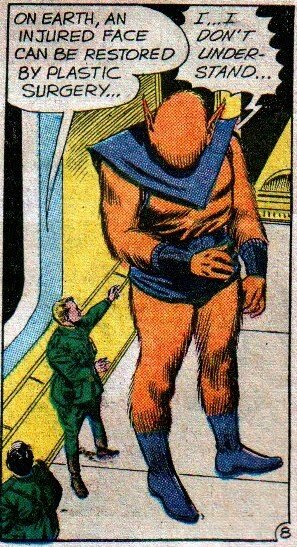 He can change his size, and in this case, I don't think from the context that it's just changing his appearance. 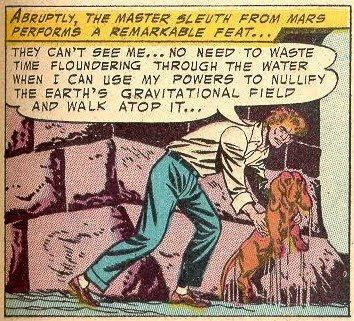 Nullifying the Earth's gravity sounds like flying, doesn't it? Still, walking on the water implies something a little different, and it's such a cool and unique power that I can't resist including it in the list. That's it for the first ten stories (Detective 225-234). I will return to this post and add more powers over time. 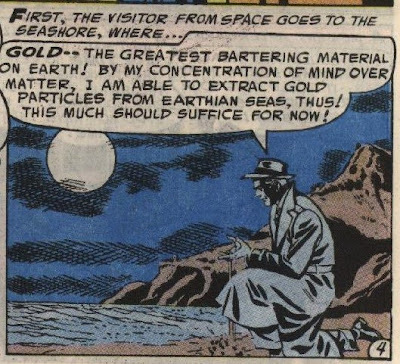 Here's the list so far: Mind-reading, changing his appearance at will, mind over matter, making his body insubstantial, invisibility, the ability to see possible futures, flying, super-sensitive hearing, X-ray vision, near-invulnerability, microscopic vision, teleportation, changing his size and walking on water.